& REVIEWED BY MARYANNE LOCHER. Here Comes The Easter Cat by Deborah Underwood with illustrations by Claudia Rueda, Dial Books for Young Readers, 2014. 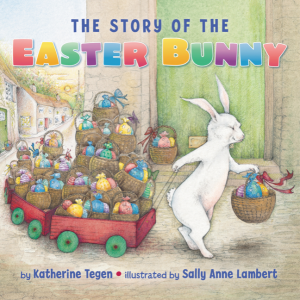 Just in time for Easter, a sweet picture book with a salty twist. 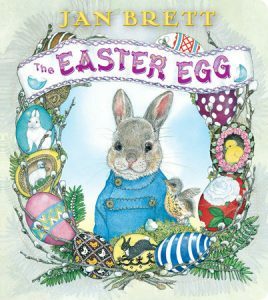 Here comes Peter Cottontail, hopping down the bunny trail … Oh! Wait! That’s not a bunny, it’s a cat, and he’s not hopping, he’s … riding a motorcycle? 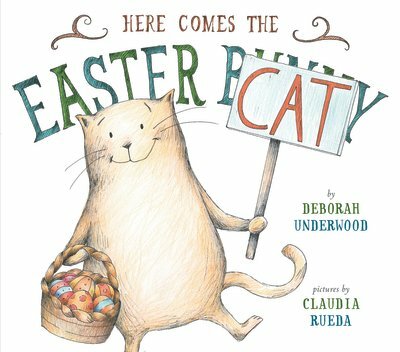 In Here Comes the Easter Cat by Deborah Underwood with artwork by Claudia Rueda, (Dial Books for Young Readers, $16.99, Ages 3-5), a clever cat plots to take over Easter. Cat decides he’ll give out chocolate bunnies, gets a sparkly outfit, and a fast motorcycle. Now all he wants, more than anything, is a nap. When he finds out that the Easter Bunny doesn’t get a nap, he’s questioning if he can handle the job. But when a tired Easter Bunny delivers a chocolate egg to Cat himself, Cat has his most brilliant idea of all. From page one, Claudia Rueda easily pulled me in with her delightful drawings of the fat cat who communicates (using picket signs and his ever-changing facial expressions) with Underwood’s unseen narrator. Cat owners will love this book whether they have a child or not. Parents will appreciate this book if they have a child who is dealing with jealousy issues. 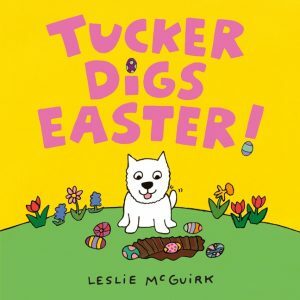 Most of all, though, children will simply adore the humorous ideas and antics of the cat. I won’t spoil the book for you, but Underwood’s fantastic ending left me thinking there might be another book on the way. Well, at least I can hope to see more of Cat.